24-7 locksmiths available by calling LockTech24/7 at Easton PA. We are mobile professional locksmiths serving Easton PA, and surrounding area. 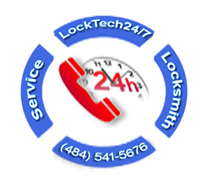 There are so many reasons why you may need locksmith who works 24 hour a day. One of the most common reasons is emergency lockout service. Unfortunately, a lock out incident can happen any time. You can easily get locked out of car, home, or business with split of a second that your mind occupied with something else. As a matter of fact, you can manage to lock yourself out in many occasions. Imagine the situation when you rash out early morning, you stopped your car to get a coffee, suddenly you lock yourself out. Another scenario of lockout incident, can happen when the key snapped and broke to half when you’ve tried to unlock the main door of your home. In any case of lockout incident, worry not, because we’re here to help. 24 hour emergency locksmith services done by our professional locksmiths can ensure you easy time, as well as short waiting time. Not only our emergency 24HR locksmiths can unlock your door in a fairly time manner, but we can also do a lot more to help you. For instance; if you’ve lost your car key, we can cut and program a new transponder key to your car. In addition, we can also remove a broken key or repair a broken lock. Our 24 hour emergency locksmith services cover, automotive, residential, and commercial locksmith services. In like manner, you don’t need to worry if we can help you or not, simply call us. In the general, we do all types of 24HR emergency locksmith services. So, in fact, it doesn’t matter what are your needs from 24-7 locksmiths. We can help you in no time, please call us now.